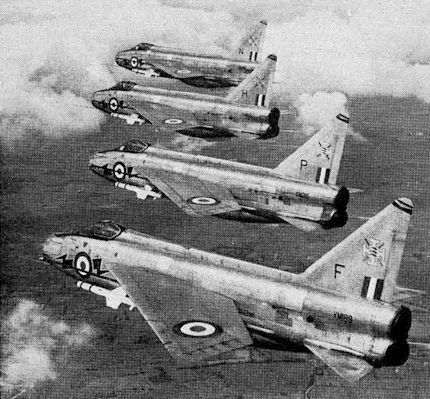 Three RAF fighter types of the ’fifties are shown together in this photograph, all in the markings of No 66 Squadron. From left to right they are the Hawker Hunter F Mk 4, Canadair Sabre F Mk 4 and Gloster Meteor F Mk 8. The RAF's first jet fighters were the Gloster Meteor and the de Havilland Vampire. 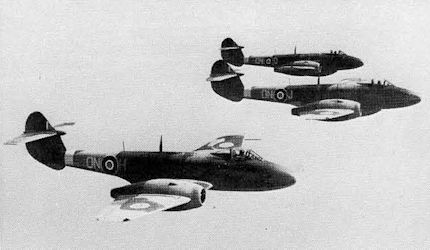 Illustrated are Meteor F Mk IIIs of No 124 Squadron in 1946. 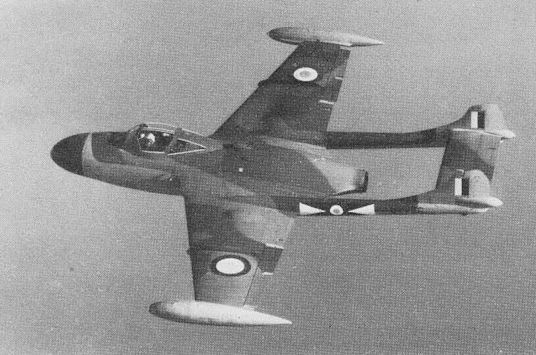 Last de Havilland fighter to serve with the RAF was the Venom, shown in its day fighter FB Mk 4 version. Last de Havilland fighter to serve with the RAF was the Venom, shown in the NF Mk 3 night fighter version, in the markings of No 141 Squadron. A Gloster Javelin FAW Mk 5 of No 151 Squadron. Throughout the ’sixties, the English Electric Lightning has provided the backbone of Britain's fighter defences and the latest versions remain in front-line service at home and abroad. Illustrated are Lightning F Mk IAs of No 111 Squadron.